My quest for a satisfactory, up-to-date replacement for Netscape Navigator 9 to use on my workhorse Pismo PowerBook running Mac OS X 10.4.11 continues, and the newly released SeaMonkey 2.0 is the strongest contender I've found yet. I've been using version 2.0 for the past week or so and am pretty pleased with it. The speed improvement over version 1.x is quite tangible - and indeed competitive with the best of the other Tiger-compatible browsers I use. I wish Google Chrome, the public preview alpha of which has become my standby on the Unibody MacBook, thanks to its prodigious speed, supported PowerPC, but it doesn't, so that's that, and in lieu, I'm finding this version of SeaMonkey no slouch in context. The Internet suite aspect of SeaMonkey doesn't interest me much in a practical sense - I basically just use the browser module - but if the one-stop shopping combo of Internet browser, email and newsgroup client, HTML editor, IRC chat, and web development tools is your cup of tea, then SeaMonkey is really the only game in town,* and it's a big help that it's a very decent Web browser. SeaMonkey 2.0 provides a more up-to-date look, better speed, and more. Mail archiving is also supported now. History is stored using a better database solution, and autocomplete has been tweaked, as has been the Password Manager. There's also a popup ad blocker and image manager that lets you block images to speed up the rendering of web pages. Find as you type lets you just start typing to jump from link to link or to find a word or phrase within a page. For a full changelog inventory, see the Appendix at the end of this column. SeaMonkey 2.0 has also received some long-overdue and much welcome interface tweaks, with an updated, brighter, more contemporary, and, IMHO, more attractive look, although there are still a few residual antiquated touches such as a tab close button on the far right of the tab bar rather than having one more-conveniently placed on each tab. The download manager is completely reworked, including (hooray!) support for cross-session resumable downloads, plus there are new-tab and new-window command line options and fully customizable toolbars. With SeaMonkey 2, everything I need is there: tabbed browsing, a real progress bar, and (hooray again) session restores are now fully supported (i.e. : not just after an unexpected quit). However, as nice as it is, SeaMonkey isn't quite the substitute for Navigator 9 I've been hoping for. The fly in the ointment, so to speak, is its appetite for memory. I really should upgrade my Pismos to a full gig of RAM apiece, but I have procrastinated and only have 640 MB in the unit I use and 576 MB in my wife's machine. All is well for the first day or two after a fresh restart, but after that thinks go downhill precipitously, with lots of swapfile activity, and eventually everything slows down to a crawl (or virtual standstill) until I reboot. This does not happen with Navigator 9 - at least not for a much longer "grace" period. I think that with a gigabyte of RAM, the problem would be solved, but until I work out the wireless dropout issue that is afflicting both the Pismos using my wireless router (no problem with the MacBook and G4 PowerBook), I'm not inclined to invest in more memory yet, but that's another movie. If you have a respectable amount of RAM, SeaMonkey is worth checking out, on Intel Macs as well as these old PPC rigs. 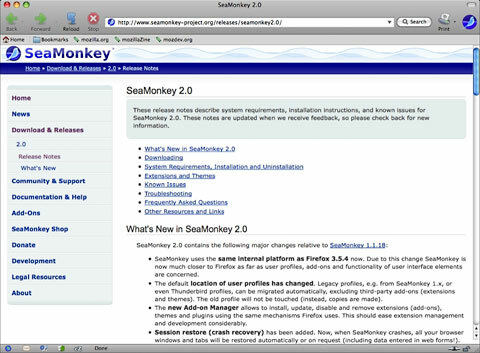 The SeaMonkey project provides official versions of SeaMonkey 2.0 for Windows, Linux, and Mac OS X in US English and other languages. Community volunteers are also contributing builds for other platforms. SeaMonkey uses the same internal platform as Firefox 3.5.4 now. Due to this change SeaMonkey is now much closer to Firefox as far as user profiles, add-ons and functionality of user interface elements are concerned. The default location of user profiles has changed. Legacy profiles, e.g. from SeaMonkey 1.x, or even Thunderbird profiles, can be migrated automatically, excluding third-party add-ons (extensions and themes). The old profile will not be touched (instead, copies are made). The new Add-on Manager allows to install, update, disable and remove extensions (add-ons), themes and plugins using the same mechanisms Firefox uses. This should ease extension management and development considerably. Session restore (crash recovery) has been added. Now, when SeaMonkey crashes, all your browser windows and tabs will be restored automatically or on request (including data entered in web forms!). In addition, users can select to always restore the browser windows and tabs from their last open session when starting SeaMonkey. Reopening closed browser windows (Undo Close Window) is now possible. History is now stored in a better database solution, so that it can easily keep more information, and the location bar determines which addresses to autocomplete and/or show in the drop down menu with a smarter algorithm based on what you type, searching in both URL and title of visited pages by default. Toolbars in the browser, main MailNews and message compose windows are now fully customizable, including icon size and whether to display icons and/or text for every major toolbar, all available via their context menus. The MailNews component now includes support for reading RSS and Atom feeds. The browser detects feeds offered by web pages, can preview them and offers different ways to subscribe to them. New IMAP accounts will now keep local offline copies by default, as a part of a number of speed improvements when working with IMAP. Synchronization can be disabled per account or for individual folders, and limited to the most recent messages in the Synchronization & Storage settings. Tabbed Mail enables accounts, folders and even single messages to be opened in tabs inside the Mail & Newsgroups window. This feature also enables the Lightning extension to be installed into SeaMonkey for calendering functionality. Password Manager was switched to an improved version, allowing easier searching, and notification bars replacing modal dialogs for remembering logins. Download Manager has been completely reworked, including support for cross-session resumable downloads. A new form manager replaces all previous web form management, and automatically keeps a record of what you type into forms and presents you these options in a drop-down list when you come back. Cookie Manager has been improved and now allows searching for cookies by site and cookie name. Most of the icons in the default theme have been exchanged for newer images that fit better with the look of modern desktop environments. The default theme on Mac OS X was completely renewed to better fit with the look of Leopard and Snow Leopard. For extension developers, SMILE is introduced, making interfaces known from FUEL and STEEL also available in SeaMonkey. Support for Windows 95, 98, Me and NT 4 was dropped. GTK 2.10 or higher is now required on Linux/Unix. Support for Mac OS X 10.3 ("Panther") and 10.2 ("Jaguar") was also dropped. ">SeaMonkey uses the same internal platform as Firefox 3.5.4 now. Due to this change SeaMonkey is now much closer to Firefox as far as user profiles, add-ons and functionality of user interface elements are concerned. The changes page has an even more exhaustive list. * Opera has built-in email, newsreader, and IM clients, but no HTML composer.